Today is the big day. It’s a momentous event. People are holding their breath. The whole world is coming to a stop as it waits expectantly. Okay – it might not be quite as big as that, but it is a kind of important day for me. This Thursday and Friday, I will be giving away free copies of my ebook, Magnus Opum. You pay nothing. Zero, zilch, nada. A great big duck’s egg. 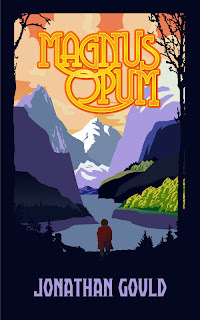 So what is exactly is Magnus Opum? You might think of it as a slightly skewed epic fantasy – Tolkien with a twist. It’s a fantasy story for people who don’t generally read fantasy stories, but it’s also a fantasy story for people who do. And like any good fantasy story, it’s full of adventures and sword fights and all sorts of derring-do. But it’s also full of laughs and unexpected surprises. Not to mention a fair share of silly poems. Readers have already described Magnus Opum as “totally magical, brimming with imagination and fantasy, and entertaining from start to finish,” and, “a master work of both parody AND satire rolled into an easy-to-read family-friendly story.” Comparisons have been made with Lewis Carroll and Terry Pratchett. So don’t be the one to miss out on the fun. Go to http://www.amazon.com/Magnus-Opum-ebook/dp/B007QGNO1I/ and grab a copy of Magnus Opum for the price of a big cup of nothing. You’d be a seldom seen but much discussed diperagoff if you missed out.